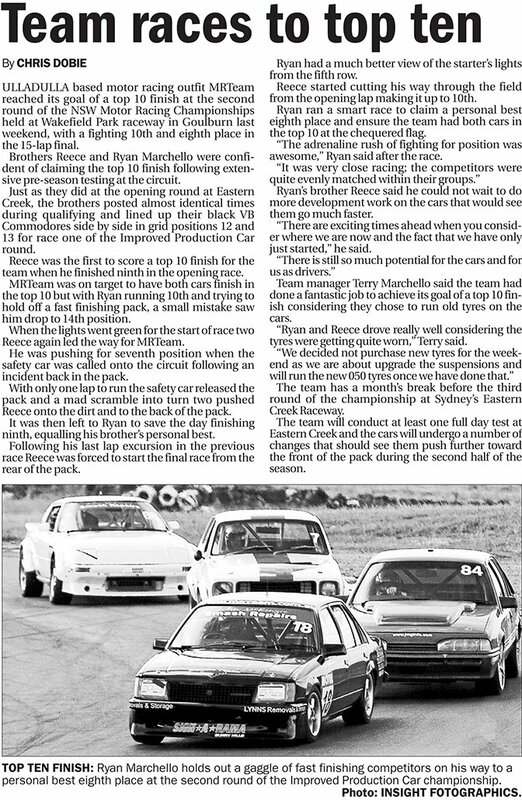 ULLADULLA based motor racing outfit MRTeam reached its goal of a top 10 finish at the second round of the NSW Motor Racing Championships held at Wakefield Park raceway in Goulburn last weekend, with a fighting 10th and eighth place in the 15-lap final. Brothers Reece and Ryan Marchello were confident of claiming the top 10 finish following extensive pre-season testing at the circuit. Just as they did at the opening round at Eastern Creek, the brothers posted almost identical times during qualifying and lined up their black VB Commodores side by side in grid positions 12 and 13 for race one of the Improved Production Car round. Reece was the first to score a top 10 finish for the team when he finished ninth in the opening race. MRTeam was on target to have both cars finish in the top 10 but with Ryan running 10th and trying to hold off a fast finishing pack, a small mistake saw him drop to 14th position. When the lights went green for the start of race two Reece again led the way for MRTeam. He was pushing for seventh position when the safety car was called onto the circuit following an incident back in the pack. With only one lap to run the safety car released the pack and a mad scramble into turn two pushed Reece onto the dirt and to the back of the pack. It was then left to Ryan to save the day finishing ninth, equalling his brother’s personal best. Following his last lap excursion in the previous race Reece was forced to start the final race from the rear of the pack. Ryan had a much better view of the starter’s lights from the fifth row. Reece started cutting his way through the field from the opening lap making it up to 10th. Ryan ran a smart race to claim a personal best eighth place and ensure the team had both cars in the top 10 at the chequered flag. “The adrenaline rush of fighting for position was awesome,” Ryan said after the race. Ryan’s brother Reece said he could not wait to do more development work on the cars that would see them go much faster. “There are exciting times ahead when you consider where we are now and the fact that we have only just started,” he said. Team manager Terry Marchello said the team had done a fantastic job to achieve its goal of a top 10 finish considering they chose to run old tyres on the cars. “Ryan and Reece drove really well considering the tyres were getting quite worn,” Terry said. The team has a month’s break before the third round of the championship at Sydney’s Eastern Creek Raceway. The team will conduct at least one full day test at Eastern Creek and the cars will undergo a number of changes that should see them push further toward the front of the pack during the second half of the season.